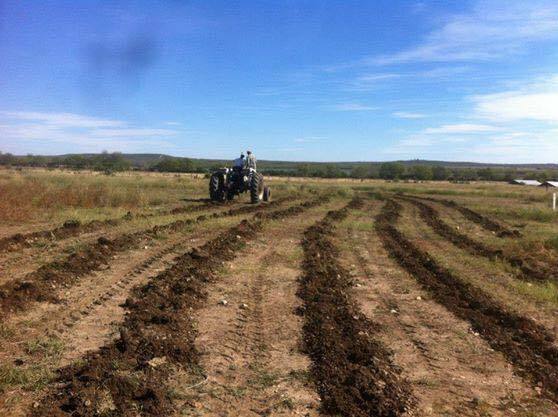 We primarily utilize three strategies to regenerate our soil and capture the rain: 1) sub-soiling, 2) holistic grazing management and 3) cover cropping. Below is a brief summary of each. Check out our Ecological Verification page to see the scientific results of our practices. The pictures say it all! These pictures were taken in 2012. 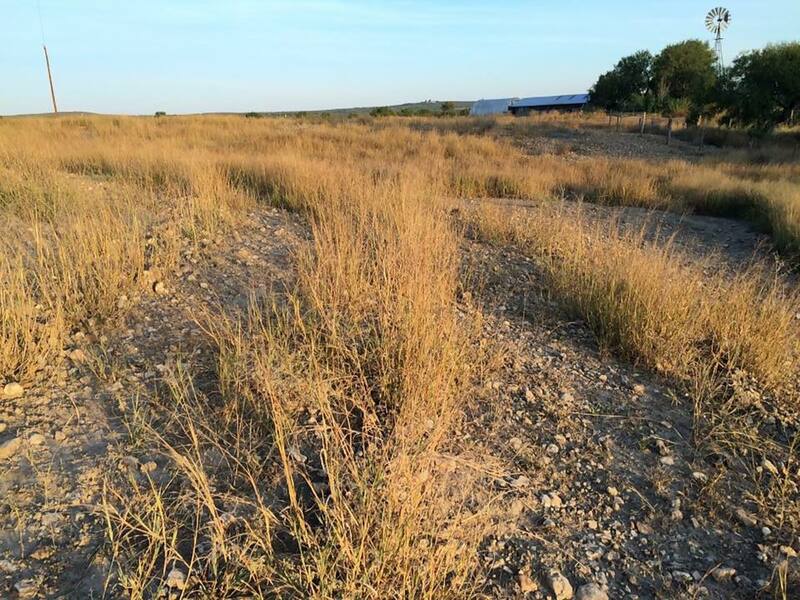 We were in the middle of the worst drought on record for Medina County, Texas. In 2011 we recorded about 6 inches of rain on the ranch and about 8 inches in 2012. The first picture with me and my good friend and former intern Chris Niels sitting on the tractor in Spring of 2012. We pulled a single shank Bison sub-soiler with my grandfathers old Ford 5000 tractor. This pasture is located near our home on top of the hill and is unrecognizable today if compared to this picture. The soil was so hard and compact that we had to weigh the sub-soiler with tractor wheel weights and fill the tractor tires with water. We ripped do a depth of about 29 inches. The picture to the right is in the Fall of 2012. It didn’t rain all summer and we had a few small rains early Fall. Look at where the grass grew! This initial experiment made me a believer. An observer needs to understand a few things about our soil. To put things into perspective we are in a heavy clay loam. When it rains and there is no vegetation cover the soil moistens at the top, the wet clay expands and the water simply “sheds” off. The water is not captured where it falls and instead makes its way rapidly to the creek and before you know it ends up in the Gulf of Mexico. Sub-soiling rips open the soil so that when rainfall events do occur it captures that water and allows it to infiltrate deep into the soil. Sub-soiling also offers another major benefit, aeration. By allowing the soil to “breathe” we are creating habitat for soil life and conditions for plants to thrive. We now pull a double shank sub-soiler with our John Deere 4055. It can cover a lot more ground in less time. We are still sub-soiling pastures every other year or so and continuing to see amazing results. Disclaimer: We DO NOT recommend sub-soiling for every type of soil. It’s all about context folks. Holistic grazing management is the foundation of our soil & water conservation practices. If the the cattle, sheep or poultry aren’t managed properly the vegetation and soil will respond negatively. Depending on which pasture and the vegetation that it consists of we utilize a one to seven day rotation. The one day rotations are in our grass pastures and the longer, seven day rotations are in the heavily forested areas. The trick though isn’t how often you are rotating the livestock, it’s how long of a rest period are you giving your pastures. We shoot for a 180 day rest period, but that is also flexible depending on the vegetation community, temperature and rainfall patterns. Holisitic grazing is an art that takes many years of experience with livestock and the land to fine tune. To achieve good grazing management we use two primary tools: 1) electric fencing and 2) portable watering system. To move cattle or other ungulates where you want them to be they need to be confined and they need water. These are the two major upfront costs to this system, but once they are in place it really pays off. We have basically doubled our stocking rate on our ranches using this management system. This means more profit per acre! No rancher is going to complain about that. The plants and soil are what ultimately benefit from this management system. When we graze these pastures we strive to leave half of the plant and no less than 1/3. By doing so we are giving the plants a chance to rapidly recover once grazed. Most of the vegetation is trampled onto the soil surface by hoof action. Remember we are talking high density grazing when you put 100 head of cattle on 4 acres for one day. Our soil tests show that organic matter and soil nutrients have increased substantially, our pastures are thriving and the overall ecology is benefiting. Cover cropping our perennial pastures during the Fall and Winter is another strategy for building soil and improving grazing. We have been experimenting with various mixes and applications for years. Our technique is very basic and cost effective. We begin our cover crop seeding around October 1. When the cattle are stocked at a high density in our perennial grass pastures we seed the cover crop using a broadcast seeder on the back of our old John Deere 2020. This tractor is light and maneuverable, which is perfect for driving across rough pastures seeding cover crops. We typically use a mix that consists of cereal grains, broad leaf forbs and nitrogen fixers. The mix we use varies with timing and rainfall, but one of our favorites is oats, ryegrass, daikon radish and arrowleaf clover. For our fall mixes we also use other varieties such as triticale, wheat, hubam clover, crimson clover and purple top turnips. For our summer mixes we primarily use nitrogen fixers such as lablab and iron/clay cowpeas. Winter cover crops have greatly benefited our soil program by covering the soil with green vegetation during a time of the year when there is often a lack of it. Keeping the soil covered is important to soil health. During the summer it keeps the soil cool and moist. During the fall it maintains moisture when the dry wind is blowing 40 mph from the North. Cover cropping has also improved our grazing program substantially by filling in the “gaps” when our perennial pastures are dormant. This has allowed us to substantially reduce the need to feed hay. Disclaimer: Once again it’s all about context. Use the seeds that are adapted to your climate and soils.